Associated Engineers of Nagpur India manufactures chemical plants and associated equipment, on-site mix systems, bulk mix delivery units and mobile explosives plants for the mining industry. For the mobile explosive plants, the Company has selected Hydra-Cell pumps for dust suppression and cooling during the drilling operation and charging the drilled blast holes with sodium nitrate explosive solution. The Hydra-Cell G03 pumps have a small footprint and are easy to accommodate on the truck. Powered by hydraulic motors they have needed no maintenance to date and are unaffected by the abrasive particles that are an inevitable consequence of mining. 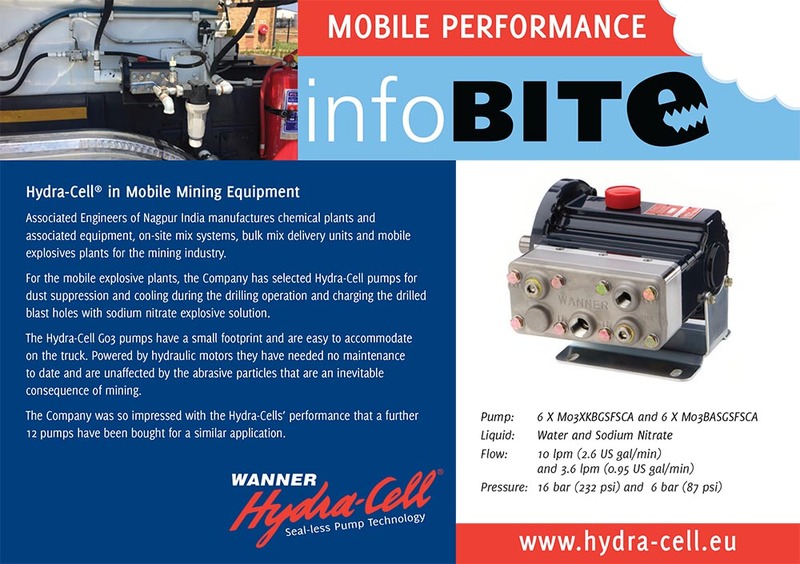 The Company was so impressed with the Hydra-Cells’ performance that a further 12 pumps have been bought for a similar application.